Wheelchair-accessible Mount Portal lookout offers gorge and river views with abseiling and climbing options, near Western Sydney, in Blue Mountains National Park. 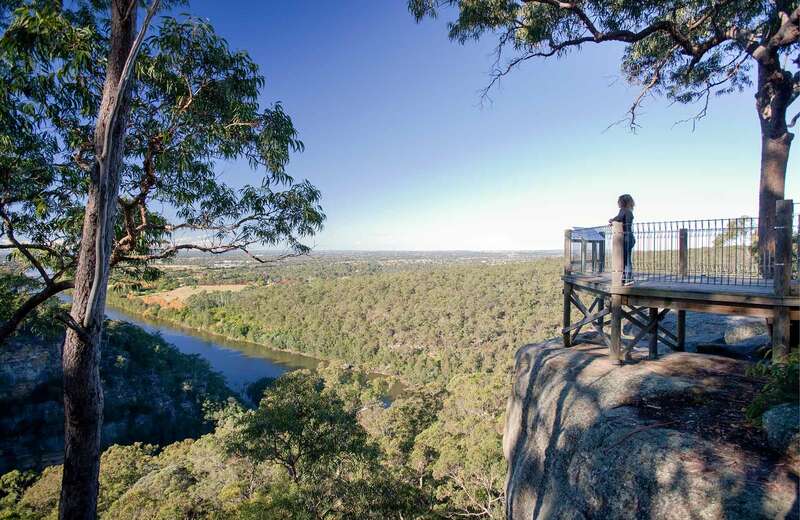 Gazing across the dramatic tree-lined gorge to the water, you’ll see how the grand sweep of Nepean River opens up to the Cumberland Plains on the western edge of Sydney. Evidence that the ridge top was an ancient river bed can be found in the large rounded pebbles, called lapstones. The shapely angophoras, with their elegantly contorted limbs, thrive in this rugged terrain and bearded dragons are often seen sunning themselves on the surrounding rocky outcrops. If you’re keen to explore the region further, check out the unique Aboriginal art at Red Hands Cave or stay overnight at Euroka campground. Take a virtual tour of Mount Portal lookout captured with Google Street View Trekker.